Overlooking the bustling intersection at the corner of Elizabeth St and Latrobe in the city stands a tall, decaying building, grey and abandoned. Its windows have been smashed in by vandals. Its walls are adorned with the scourge of graffiti. In its prime it would have been quite a stately building. Now commuters and business hordes alike shuffle past taking no notice of the structure, continuing past as they make their way through the city streets. Coming out of Melbourne Central Station, I stand at the traffic lights across the intersection from the building, and wait to cross. For the last couple of months I have passed this building every Tuesday on my way to my internship at a Melbourne arts website, and every time as I wait at the lights, I look on in dismay at the building’s condition. Only last year did I take a photo of this building when I was in the city for Moomba, and I can’t believe how quickly it has deteriorated since. Home of Journalism. Why did they write that? What did it mean? My curiosity further piqued, I hurried over the road to my internship, sat at my computer, and started to research. I was amazed, and depressed, by my findings. 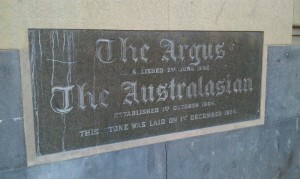 The said building was no other than the Argus Building, which til 1957 had been the hub for journalism in Melbourne. 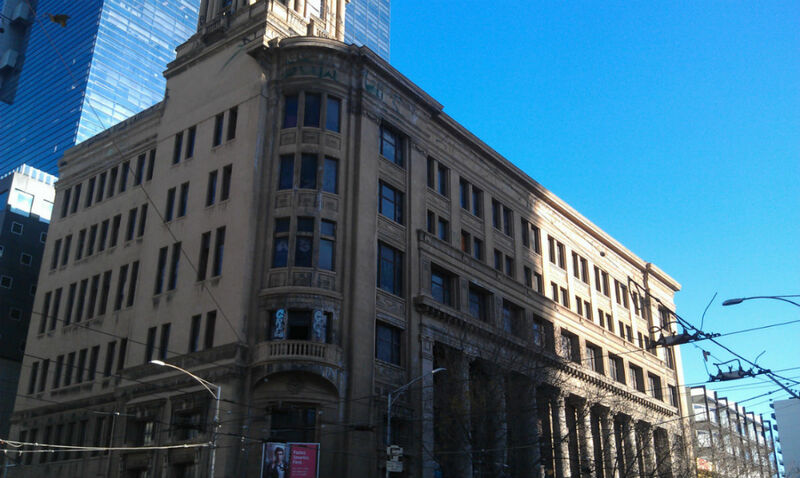 Constructed in 1926, the building had been home to daily morning paper The Argus, which took over Melbourne’s first daily newspaper the Daily News in 1852. The Argus became the first newspaper in the world to publish colour photographs in a daily paper, and was The Age‘s main rival, also stable-mate to the weekly The Australasian. The paper saw Australia through some tough times, including the Depression. The paper struggled during this time, though, and was bought out in 1957 by the Herald and Weekly Times group (managed by the Murdoch family). The Argus printed its last issue, and closed its doors on the industry. It has remained abandoned ever since. Knowing this now, seeing the building fills me with even more sadness, especially amid the current upheaval in the newspaper industry as it makes the transition from print to digital media. In many ways, the crumbling Argus, standing at the corner, is symbolic of what many regard as a dying industry. It seems ironic, further, that I am passing this hub of print journalism every week on my way to writing for an online publication. The Argus remains heritage-listed. In 1991, an innovative office building was built next door, and named The Argus Centre. The Argus has been bought a couple of times since its closure – first by Latrobe University, who intended to renovate the site and convert it into an educational campus. The university had to abandon its plans, however, due to emerging redevelopment costs, including the removal of asbestos. Consequently the building was sold again in 2010, and is now owned by the Melbourne Institute of Technology, who has similar plans. No progress, though, seems to have been made. ‘But it is deteriorating as we look at it and I want to give them (property owner) the strong message that we will not tolerate the tactic of allowing a building to deteriorate to a point where you can’t do anything with it – we will be saying to them we are putting you on notice now’. Cnr Doyle said if the building was restored to a safe level the council could consider renting it for community space until the owner was ready to use the site. I really hope we get to see this magnificent building restored to its prime. You can read more about the Argus Building’s history here.